Sponsored by the World Wildlife Fund (WWF), Mr. Tim Smith, Consultant with World Wildlife Fund, Mr. Ramon Frutos Sr., former Chief Meteorologist for the country of Belize at the National Meteorology Department and Ms. Nadia Bood, Climate Change Advisor for WWF for the Meso- American Region travelled to San Pedro on Tuesday November 16th to give a presentation on Climate Change and adaptation to Climate Change. The presentation was held at the San Pedro Lion's Den at 7 pm, and saw the attendance of about 30 individuals from the various sectors of the Island. The presentation highlighted information on climate change, projection for climate change within the country of Belize, implications for coastal communities and some of the programs that the WWF has been working on to try to combat climate change within the country. In an interview with Mr. Tim Smith, he explained that San Pedro would be affected in three major categories of threats related with climate change. The first being more frequent and intense storms and hurricanes, which would not only affect San Pedro, but the country on a whole; as well as further hurricane and storm related damages. The second would be higher levels of sea rise over, as a result of the melting of the polar ice caps. He indicated that studies have shown that over the next hundred years, sea levels would rise by 1 to 1.5 meters. A third category that would directly affect the island of Ambergris Caye would be the condition of the reefs that line our coast. Changes in water chemistry associated with climate changes are already causing negative effects on the reefs. Climate changes cause an increase in the water temperature gradually killing the corals, placing our reefs at great risks. The main source of income for San Pedro, and quickly becoming a major source of income for the remainder of the country; is Tourism. 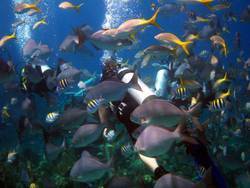 Tourism greatly depends on the conditions on our underwater coral reefs systems. Ms. Nadia Bood explains, "Climate Change affects our reefs in terms of bleaching events. Whenever we have an increase in atmospheric temperature you also have an increase in sea surface temperature. As the water temperature increases, the corals on the reefs become stressed. Corals already exist near their threshold level in terms of temperature. The stress on the corals causes them to expel a vital algae, which is generally maintained within the tissue of the corals and provides them with 90 percent take of their food source. The loss of food causes a pale coloration and loss of vitality. The corals basically starve. Another effect on the corals is a decreasing ability to protect themselves from pathogens." Fishermen, hoteliers, locals and pretty much everyone that live on Ambergris Caye depend on our Reef in one form or another. Other than providing world-class diving and snorkelling experiences to our visitors year round, our reefs serve as a barrier that protects us from otherwise catastrophic effects from storms and hurricanes; including beach erosion among others and millions of dollars in damage to beach properties. The World Wildlife Fund (WWF) is promoting a No Regret Option - prevent coastal erosions, as an immediate way of assisting. Mangrove planting has been going on the prevent erosion along many coastal communities in Belize including Placencia and San Pedro. Presentations like this one is being held at various locations to increase education and making people more aware of climate change. An even more disappointing fact is that HUMANS are the major cause of the current Climate Change as well as Global Warming. As a community, there are certain things that we can do. Each individual has a Carbon Footprint - this is decided by our lifestyles. The decisions we make in transportation, energy consumption in our daily lives. Interestingly, as an individual we can assist in causing a positive effect on climate change. Energy Conservation; turn off appliances at home that are not being used, walk or bike to the store instead of driving, use biodegradable products and preserve our mangroves are among some of the things that we can do to contribute.